Newport castle is now able to save very little of the past glory, but the remaining ruins of the fortress still arouse interest in the curious history and dignity. 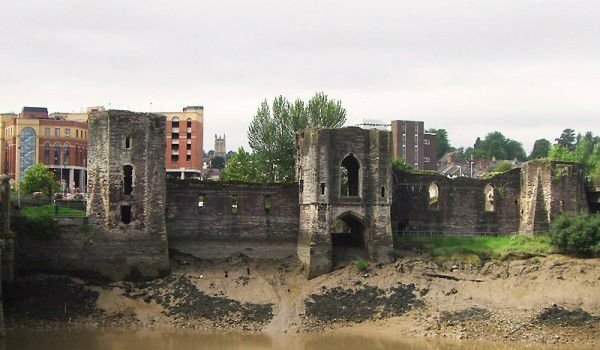 Newport castle is located on the river Usk, right beside the bridge that passes over it. The fortress or what is left of is between the railroad and the transition road in the town of Newport, located in southeast Wales. Newport castle is located right in downtown. Its foundations were laid in the 14th century and the main aim of the fortress was to protect this world and it’s areas along the river after the passing ships. It is anticipated that the construction of the castle began in Newport in 1327 and was completed in 1386 by order of Hugh d'Audele or his son Ralph, who was Earl of Stafford. Newport castle was built on the remains of an early Norman fortification, which is located on Stow Hill. The model of the castle is customary for most medieval castles - with a firewall fence and patio with the main building. There was at least one major portal through which one could enter, although today we can not see evidence of this through the ruins. Indeed, much of what we see today from Newport is the remains from 1405 from Owain Glyndwr, who made the overhaul of the fortress. He also raised the three main towers which dominated the river. In the second quarter of the 15th century Newport castle was again restored and was further decorated by Humphrey Stafford, who became the first Duke of Buckingham. He strengthens the surrounding walls, as well as repairs and modernizes the south tower. After 1521, when the third Duke of Buckingham was beheaded, the castle in Newport began to decline. Owain Glyndwr was fully operational in less than 200 years, and for that time it was inhabited only slightly from it’s masters. Jasper Tudor, who was uncle to Henry VIII, lived there briefly in the early 16th century. Today Owain Glyndwr stands in the middle of a very busy road link and the law does not make it an official tourist site.